Hi everyone, it has been a while since I have written a blog and my dear mother in law reminded me of such yesterday so I guess this one is for you Ruth Anne. 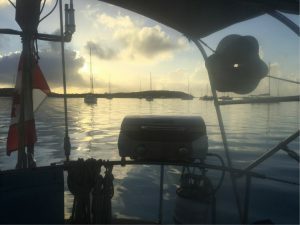 Eric has pretty much kept you up to date to our little day sails to different points here in the south of the Exuma Chain of Islands. The Bahamas are 700 islands with only 30 inhabited, this is not counting the Cays (keys). The islands are divided up like provinces, ie; Berry Islands, Abacos, Bimini, Grand Bahama, Andros, Exumas, Long Island, and there are others. We have visited very few when you consider the vastness of the area that these islands would have. So we are just finishing a 4 week visit in the Exuma and Long Island area. This past week, Jan 27 – Feb 3, we had Andrew and Amy come and spend time with us. For me, it was just what the doctor ordered. It was such a blessing to have them with us, even though Amy was pretty sick when she arrived, we were concerned that they might not make it! I’m sure it was out of her sheer will that she got here. While they were here Amy had a few activities on her wish list, seeing the swimming pigs and iguanas and Andrew wanted to snorkel and scuba dive. I think we checked everything on their list and maybe a few more experiences. On Monday it was overcast and we pretty much relaxed. Amy was pretty much spent from the travel, short on sleep from coughing and getting up early to catch their plane. Eric and Andrew went into Georgetown in the evening for Rake and Scrape. 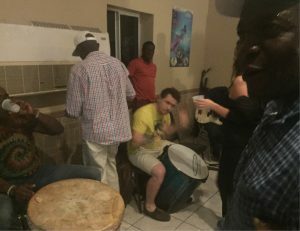 It is the type of music that is native to the Bahamas. It involves hand made drums(Goombay), hand saw/hammer, guitar, accordion and what other instruments might be available. On Mondays you can go the local pub and possibly join the ad hoc band. Andrew got the privilege and joy to play with them for a song, I know he would have loved to play with them more but it was not to be. 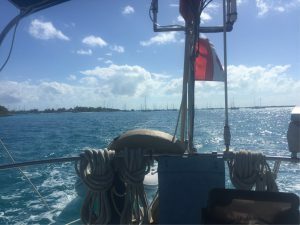 Tuesday we sailed to White Bay Cay (key) . On White Bay Cay we saw the swimming pigs. Yes they do swim….. out to your inflatable dinghy…. and then try to get in so they can eat all the carrots FIRST! Yikes!!!! They are quite aggressive, they don’t share well to the point of biting each other, running each other over so they can get the carrots, hmmmm so when you call someone a pig it is definitely not a compliment. It was wild there for a while, you had to hide that you had any carrots or they would be all over you. As soon as we ran out of carrots they literally ignored us, the ungrateful wretches! They just threw themselves down on the sand and went to sleep which was nice for us, since we could then look around and we found 2 litters of piglets who were about 3 weeks old. Wednesday we went over to Leaf Cay to see the rock iguanas. On this wee island there are about forty iguanas of all sizes sitting on the beach. We had cabbage to feed these much more patient and polite reptiles. Yes some of the old codgers were staring each other down but none of us felt we in danger of getting our fingers bit off or toes trampled on. 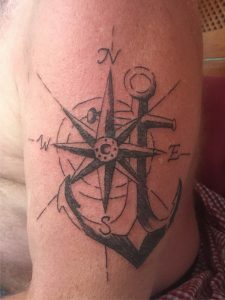 Thursday -Saturday we hiked, snorkeled, scuba dived, got tattooed and just enjoyed one another. Sunday came all too early and I must say they were wishing they could stay as well. They returned tanned, relaxed, refreshed and for Amy almost healed ready to return to the winter life looking forward to spring to come soon.